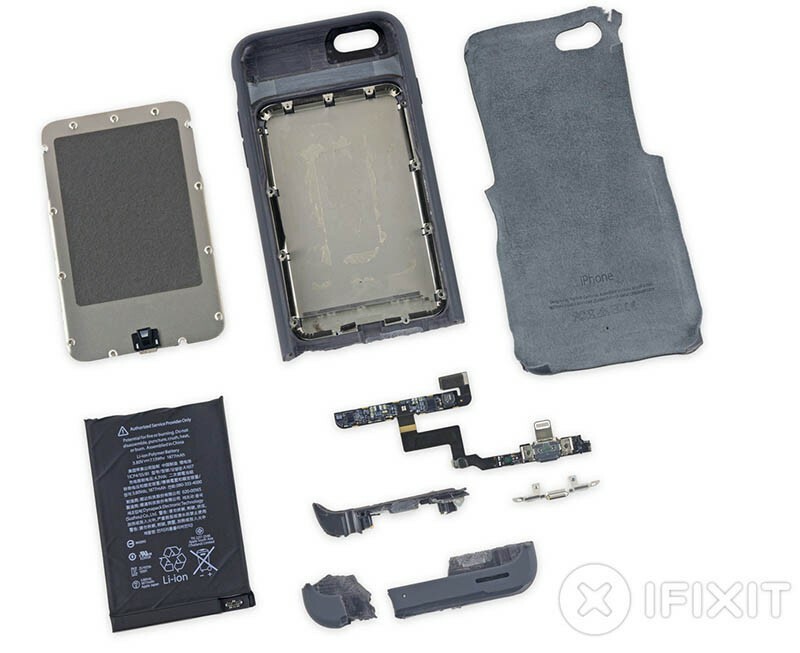 iFixit has completed a Smart Battery Case teardown, providing a closer look at the case's brushed aluminum inner shell, rechargeable lithium-ion battery and tiny logic board housing two Lightning connectors. The inner aluminum plate serves as a door for the battery compartment, which houses a 1,877 mAh battery (7.13 Whr) that more than doubles the iPhone 6s battery capacity of 1,715 mAh. iFixit says the battery is "very strongly adhered in place" with a connector rather than soldering. 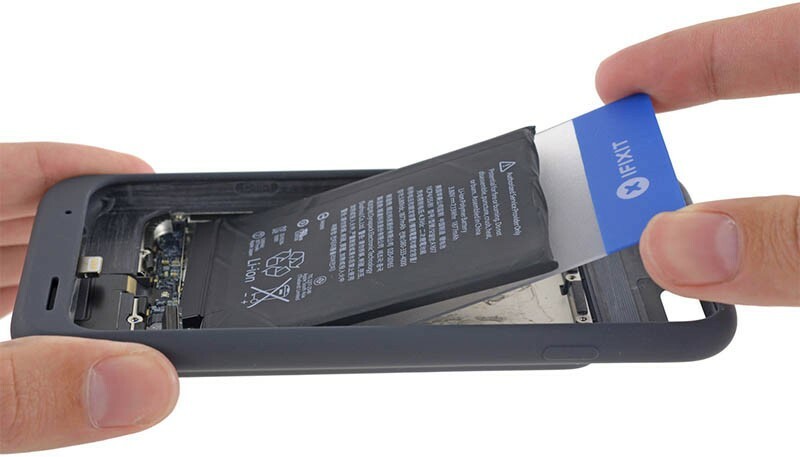 Much of what makes Apple's Smart Battery Case "smart" is powered by the iPhone, as the case only has a few other components, including a NXP NX20P3 load switch, also found in Lightning to USB cables, and a NXP 1608A1 charging chip. iFixit awarded the Smart Battery Case a repairability score of 2 out of 10, with ten being the easiest to repair. While the battery pack can technically be replaced, the case has a strong adhesive lining, and all other repairs would destroy the accessory. Sorry, please point me to the complaint about not being able to sell a kit. A link would be nice. I guess I fall into a minority where I don't hate a website because they gave my favourite company a bad score. Still such a weird concept to me. I've found iFixit to be very useful in fixing my iPods and iMacs over the years (instead of just binning slightly broken devices). And now very interesting as I learn how well designed some of their newer systems are. But eh, some people just aren't into that it seems. It's an accessory, I don't think people would expect it to be repairable to begin with. I'm not sure Apple themselves would bother repairing them, they probably just give you a new one and recycle what they can. We might as well give Apple's cables, adapters and headphones a repairability score as well while we're at it. Is it wrong that my first thought was, "I can't believe they spent the time and money to do this"? Repairability is a thing of the past (as we meanwhile know it's close to 0). A durability and recyclability scale would be much more interesting..
Again, another Apple release, another ifixit complaint piece about how they can't sell kits. I can’t wait until the day you take your car for a cam belt change and they tell you that the engine is sealed and you need a new car.